In previous films “Taiyo no Uta” (“Song of the Sun,” 2006) and “Gachi Boy” (2008), whose protagonists suffered from rare medical conditions, Koizumi proved he could connect emotionally with audiences minus the usual tearjerking. “Taiyo no Uta” was a commercial hit in Japan, while “Gachi Boy” became an unlikely festival favorite, winning the Audience Award at the 2008 Udine Far East Film Festival. Meanwhile, the tone is primarily celebratory and nostalgic in the vein of the two hit “Always” films, which were also produced, like “Flowers,” by Robot Communications, of which Koizumi is an employee. They made late-1950s Tokyo glow with human warmth, whatever the gritty and hardscrabble reality. The story of “Flowers” begins in 1936 with Rin (Aoi) — a sensitive, educated girl from a wealthy family who has been pledged in marriage to a man she has never met. When she protests, her irascible father (Sansei Shiomi) shouts her down. She must marry, he says, or the family’s reputation will suffer. She decides to run away instead. 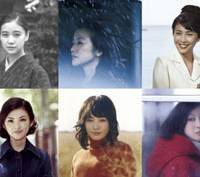 But not too far, since when the scene changes to the 1960s, her three daughters from that marriage — Kaoru (Takeuchi), Midori (Tanaka) and Sato (Nakama) — are venturing out into a world radically different from that of prewar Japan, with its patriarchal family system. Unlike their mother, they are free to choose their own destinies — and we see the results in three separate time frames. In 1964, Kaoru marries her sweet, bashful, but dishy college professor (Takao Osawa), but is soon left alone again. In 1969, Midori is a hard-charging career woman at a publishing house, constantly battling male-chauvinist colleagues. In 1977, Sato is enjoying life as a suburban housewife with her husband and daughter, and is expecting a second addition to her happy little family. 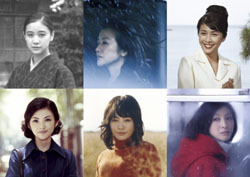 Then the scene shifts again to 2009, when we meet Sato’s two grown daughters: Kana (Suzuki), a failed concert pianist living in Tokyo and pregnant with the child of a former lover, and Kei (Hirosue), who has followed in her mother’s housewifely footsteps in the provincial town where she was raised. Then Sato dies and Kana returns home for the funeral, and a confrontation with the choices she has made. Shu Fujimoto and Uiko Miura are listed as scriptwriters, but the various stories feel less written than focus- grouped to satisfy the fantasies and pluck the heartstrings of the widest possible female audience. The solutions to the heroines’ various dilemmas mostly include finding Mr. Right — or Mr. Good Enough — and having babies, which should please all those male politicians and bureaucrats fretting about the population crisis. As in TV commercials, Onuki’s included, “Flowers” is less about credible characters or narratives than the right image and message. The film softens and beautifies even the unpleasant bits (Rin never looks so lovely as when she is escaping under the blooming cherry trees), while leaving the audience with this positive thought: Happiness, all you beautiful Japanese ladies, is your birthright, generation after generation. So what if the relationship or marriage doesn’t pan out as expected? There’s always the cute baby to hold or the sister to lend an understanding ear or, when all else fails, the lush garden to water. Shampoo, thankfully, doesn’t enter into it.